Walker posted an impressive week against a defending state champion and a Top 10 South team. He finished the week with 13 points. Walker started his week by setting a program record with nine points against Centennial (Roswell, Ga.) on Feb. 28. Walker scored seven goals and added two assists, including five goals in the first half. His five first-half goals helped the Longhorns to a 9-7 halftime lead and eventually the win. 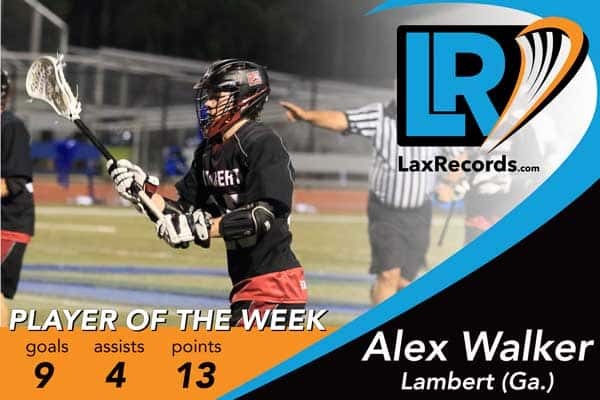 Two days later, against the defending Class 5A champion Allatoona (Ga.), Walker amassed four points on two goals and two assists in a 15-6 win. The Longhorns extended their winning streak to 26 games with the wins last week, which puts them in the Top 4 for the longest active streak in the nation. 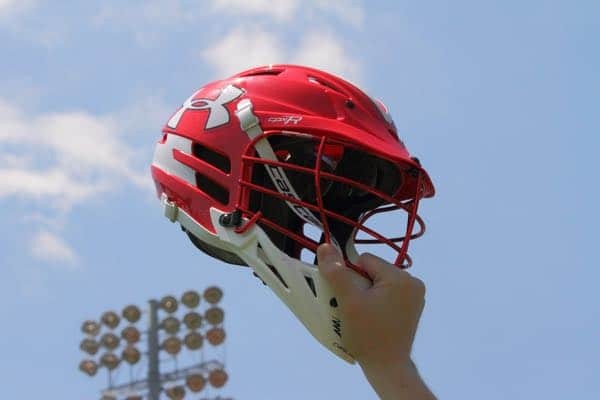 The 11 goals they gave up against Centennial was the most allowed in a game since they allowed 11 against Johns Creek (Ga.) on March 11, 2016. Both of those games on the road. Outside of those two games, Lambert has not allowed more than eight goals in any game of the last two seasons. Baker, a Player of the Year candidate, scored six goals and added three assists in two games last week. This included a three goal, one assist game against Maclay (Tallahassee, Fla.) on Friday. Goller scored three goals, including the game winner in a 9-8 overtime win over Oak Ridge (Calif.) on Tuesday. Lalicker scored four goals and added one assist in 12-11 win over Athens Drive on Thursday. The performance came in the first game of the year for Apex. Lecky scored four goals and had one assists as Lake Norman defeated Charlotte Country Day (Charlotte, N.C.) 12-4 on Friday. Overbay had an impressive week for the Longhorns. He had six assists and one goal in the win over Centennial and followed that up with three assists and one goal against Allatoona. Peek scored four goals to lead Mill Creek to a 10-9 win over Johns Creek on Friday. The win helped the Hawks improve to 5-0. Scored five goals in an 8-4 win over crosstown rival Chattahoochee. Also had one ground ball. That win helped the Gladiators improve to 4-0 on the season. 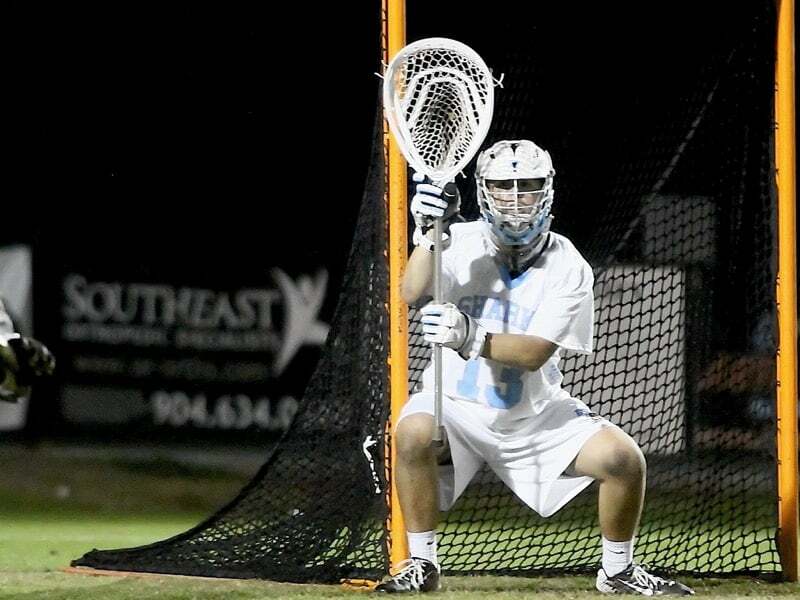 The Sharks’ goalie helped the team to a 15-13 win over IMG Academy (Fla.) on Saturday. With the win, Ponte Vedra snapped the Ascenders 20-game winning streak. Shargel helped lead the Chargers to a 9-5 win over West Ranch (Calif.) with three goals on Saturday.